After a marvellous stay at MiaClara Relais in Alba, we moved up 70km north of the world famous Langhe region. Nestled in the Monferrato area (everything north of the city of Asti until river Po), Gabiano isn’t a place you would just stumble upon. I did my research very well and I have to admit that I know the Piedmont from my early ages already so there aren’t many places that are not on the radar. However it was this summer only when I found out about Castello di Gabiano. Honestly, I wasn’t much into the idea of staying anywhere outside the Langhe area however having had four days this time with Lukas, I thought why not giving it a try. And in fact Gabiano is very (very) remote. Reaching the nearest highway is quite time consuming already and it’s actually quite a while to Alba (thanks to my father we made it in under an hour). However I was pleasantly surprised by the hotel which I expected to be completely different. 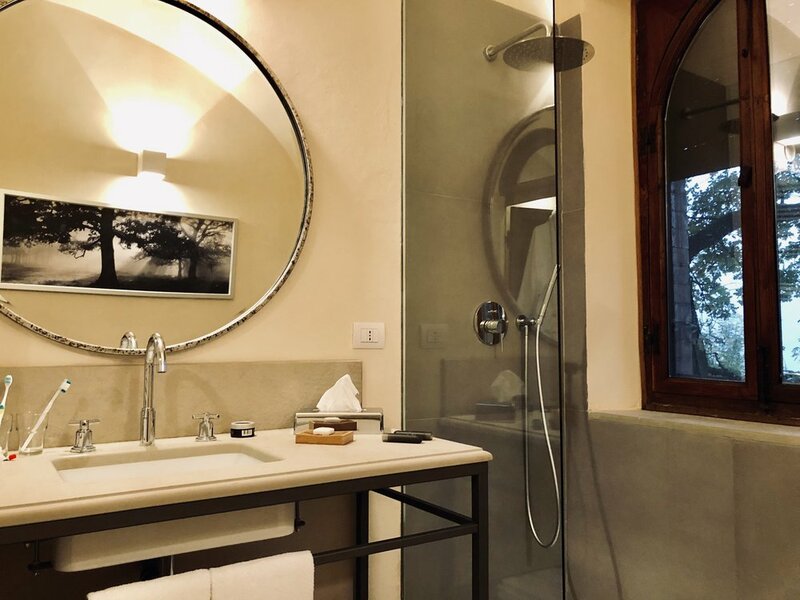 First secret revealed: the hotel Castello di Gabiano is actually not situated inside the castle, all suites are nestled in renovated buildings around the main castello. While my parents were a bit disappointed at first, I loved not to fully indulge in the medieval past of Italy: hello modern bathrooms and working technology! 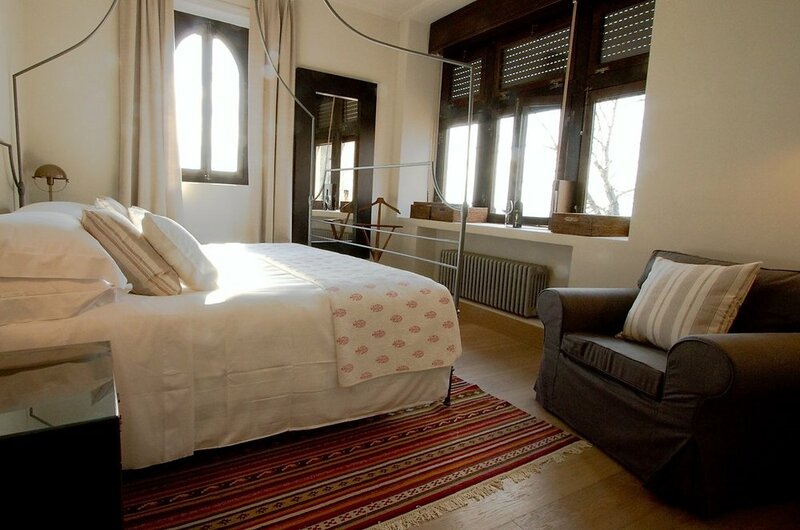 We were assigned the La Meridiana Suite which was located in the newly renovated Palazzolo. The resort is split up in three main buildings: the first building is the one where the front desk is situated as well as the wine tasting room, followed by the second complex hosting the restaurant in addition to a few restaurants and then comes our building hosting a handful of new suites. On their website you can see every suite and check which design most attracts your preference. Unfortunately we experienced a shock as the weather changed from one day from 26 degrees Celsius and sun to 10 degrees Celsius and rain so it wasn’t the sexiest arrival however thank god they already turned the heating on and therefore our arrival was perfect from entering our suite. La Meridiana is actually one of their most spacious suites and I liked the spacious layout and the semi separated living- and bedroom. The entire interior design was wonderfully redone and represents a bit of French countryside style topped with Italian freshness. Wooden floors add a further warm feeling and there was plenty of storage space in our entree. While the bedroom offered a lovely four poster double bed (how could it be different in a castle), two nightstands, a writing desk with a tiny television, the living room was equipped with a sofa, comfy armchair and writing desk along a quite spacious kitchen that had a sink, fridge and equipment to actually prepare dishes. Staying on the real Italian countryside in midst of vineyards comes with some downsides including some unwelcome flatmates. Other than that (an issue hard to avoid when being situated surrounded by trees and fields) we didn’t have any housekeeping issues and they even cleaned the room and prepared the bed on a daily basis. Fresh towels were provided as well which was perfect - I hate using wet towels when it is already so cold outside. Noting that we are in Italy plus remember Monferrato is not the Tuscany or Lake Como where you pay 800 euros upwards, so don’t expect a bed as expensive as a car. We slept better than at previous hotels in Piedmont and the interior design of the room is just lovely. 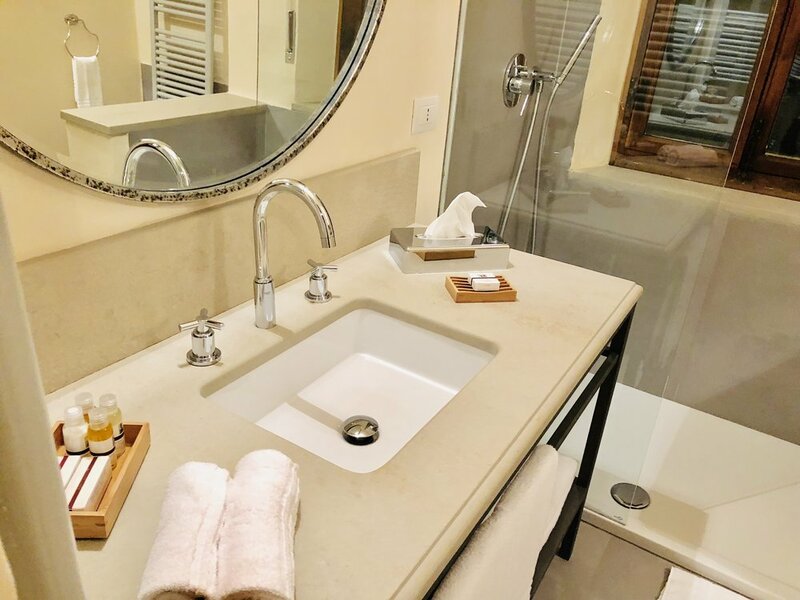 I would like to point out that the bathrooms are absolutely on par with a spacious walk-in shower, toilet and bidet as well as a nice vanity desk with lots of light and nice smelling Italian-based toiletries. Considering all the good stuff, I would totally stay at the suite again. 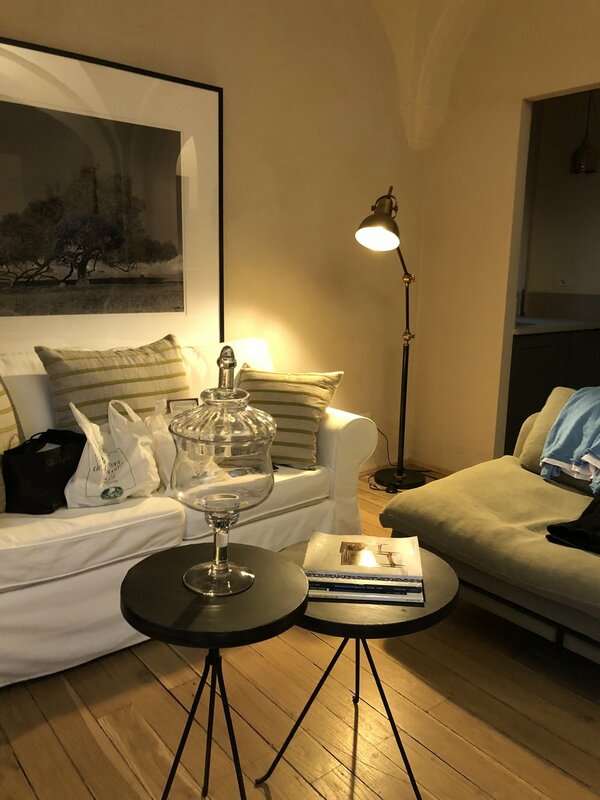 We had a room with breakfast package, however overslept the breakfast on the first day just because we had the most sumptuous dinner at an old favorite of my family serving a never ending menu in a stunning atmosphere - you can tell the rest (Two bottles of Barolo to name it). We had a look onto the breakfast the last day and were pleasantly surprised. A sleek Italian buffet breakfast was set up in the restaurant area of the Castello di Gabiano. A personal recommendation of mine is to book it with the room or take it on the spot for 12 euros as my parents tried to find a nearby bar and weren’t really successful on that. Generally the area around the hotel seemed a little bit dried out with no gastronomic sensation or famous restaurants. Castello di Gabiano is also the only luxury hotel I would stay between Langhe and Torino. On our first evening we drove around 50 minutes (noting we wanted to eat at that specific restaurant and my father didn’t mind driving) while the restaurant on the second day would have been a 25 minute drive away. I was told that since a few months they also offer a restaurant on-site serving one menu at a very reasonable price. Since a stay in the Piedmont always means eating at fabulous places in remote locations, the hotel restaurant wasn’t one of our options and therefore we were up for another adventure so exciting we even missed our restaurant reservation. More on that on another post. Overall we had a very wonderful stay at a totally hidden gem in the center of the Piedmont. 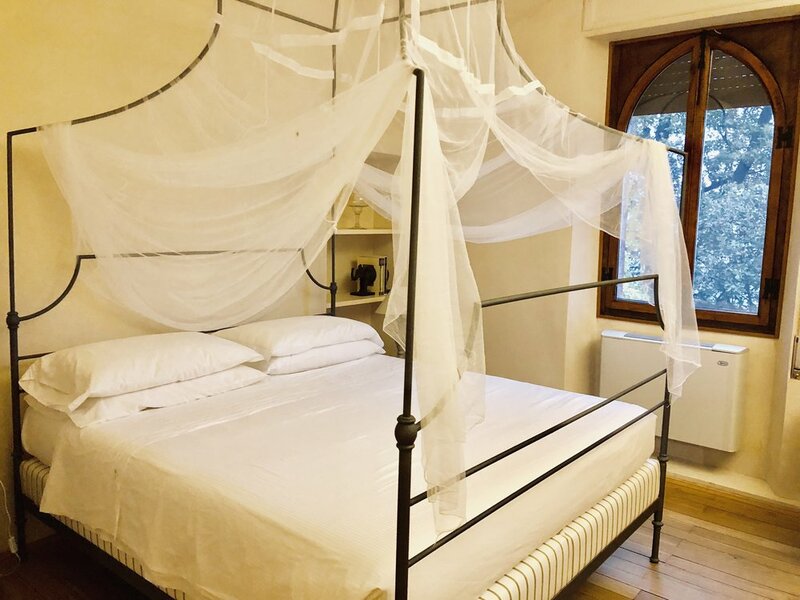 Unfortunately Alba is quite far away (and it is the main reason for me traveling to this corner of Italy) therefore Castello di Gabiano might not be my first choice. However should I plan to travel to Torino (can be reached in 40 minutes) again or discover the Monferrato (which I couldn’t do extensively this time and will definitely catch up on) Castello di Gabiano is the number one choice without any doubts! I also have the desire to stay at the hotel during the warmer months because their outdoor pool looks very photogenic in front of the medieval and picture perfect Italian castello. We were guests of Castello di Gabiano, however all above written expresses our own opinion and has not been influenced.